Has ExxonMobil Aviation Oil Elite 20W-50 Been Discontinued? When you think of Halloween, you're probably not thinking of petroleum. You think of candy, right? And costumes. All the fun stuff. Now, while Halloween itself might not have any major impacts on the petroleum industry, it's no trick to say that the petroleum industry plays a role in the production of your favorite Halloween treats. Petroleum is found in everything from the costume makeup you wear to the candy you get going door-to-door. Don't believe us? Check out our breakdown of a very petroleum Halloween below. South Korean artist Jung-ki Beak was inspired to create armor " out of Vaseline because he views it as a symbol of protection. But we really don't recommend going this route for Halloween, if we're being honest. Petrol the Dancing Clown "
Clowns are all the rage lately, for better or worse. 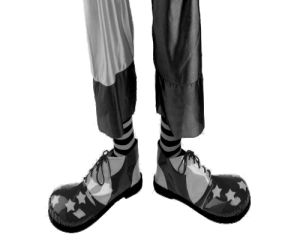 And with the rise of clown sightings a 'la urban legend, we're predicting the popularity of clown costumes (unless if you're in Kemper County, Mississippi, where clown costumes are banned until November 1). If you're going for a vibrant, poofy wig for the ultimate clown hair, chances are it's made from synthetic fibers, such as acrylic, modacrylic, nylon or polyester, which are made from crude oil. If you're using Halloween makeup, chances are at least some of the products contain parabens, mineral oil, paraffin, or fragrance, " which are all made from oil. And that iconic plastic clown nose? You guessed it: petroleum. If your costume is off the rack, it's all but a guarantee that your ensemble is made from synthetic material. Like your perfect clown wig, these fibers are likely polyester. If you're decked out with any kind of plastic buttons, plastic zippers, or Velcro , those are also petroleum products. Whether you're wearing your own normal " shoes or obnoxious clown shoes, if they contain synthetic rubber, they're made from oil. Synthetic, man-made materials? Oil. Ditching the full face of clown makeup? Then you'll need a terrifying clown mask. Most Halloween masks are made from latex. And while latex is found in nature (it's a milky fluid found in 10% of all flowering plants), synthetic latex is made from polymerizing a monomer such as styrene (which is derived from, petroleum and gas by-products). Since all plastic is made from petroleum, any plastic Halloween prop you use this Halloween is made from petroleum. Using some fake blood for that truly authentic killer clown look? While fake blood recipes vary, most will contain some type of petroleum product, such as synthetic red dye. Do you want a balloon? They Float... and some are even made from petroleum. Did you carve a jack-o-lantern? Chances are the candle you're using a petroleum product, too. If you're collecting your candy in a classic plastic pumpkin head, a plastic bag, or any other container made from plastic, nylon, or synthetic fibers, you've got oil. 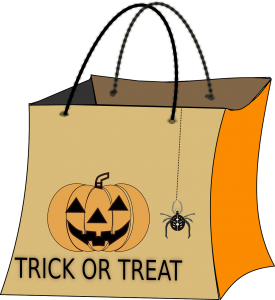 Did you know that your trick-or-treat bag contains petroleum in two ways? When you fill it up with all your delicious candy, you're likely adding some petroleum-derived treats. Yes, candy is also a petroleum product. Those gum balls you like to blow, snap, and pop? Gum isn't really made from natural rubber anymore, but rather High-Purity Iso-Butylene (HPIB), which is made from petrochemicals. Chocolate often contains paraffin wax to keep it from melting at room temperature and give it a shiny appearance. While not necessarily a Halloween " candy, treats like jelly beans are often coated in wax (sometimes paraffin) for that finished " look we know and love (or hate). Love brightly colored candies? Red No. 40 is prevalent in foods, including things like gummy bears, M&M's, and CANDY CORN. Artificial food colorings are made from petroleum. Approximately 0.4% of a barrel of crude oil is made into miscellaneous products. " Each barrel " contains 42 gallons of crude oil, but once its refined, it becomes 45 gallons of product. If approximately 94 million barrels of crude oil are produced a year, then that means 16.9 million gallons of refined oil are used for miscellaneous products " each year. Now, we're not saying that Halloween alone requires 16.9 million gallons of oil, or that this one particular holiday can singlehandedly affect petroleum consumption ...but we're certainly not not saying that, either, if you know what I mean. are candles made from petroleum? is gum made from petroleum? is halloween candy made from petroleum? is there petroleum in chocolate?